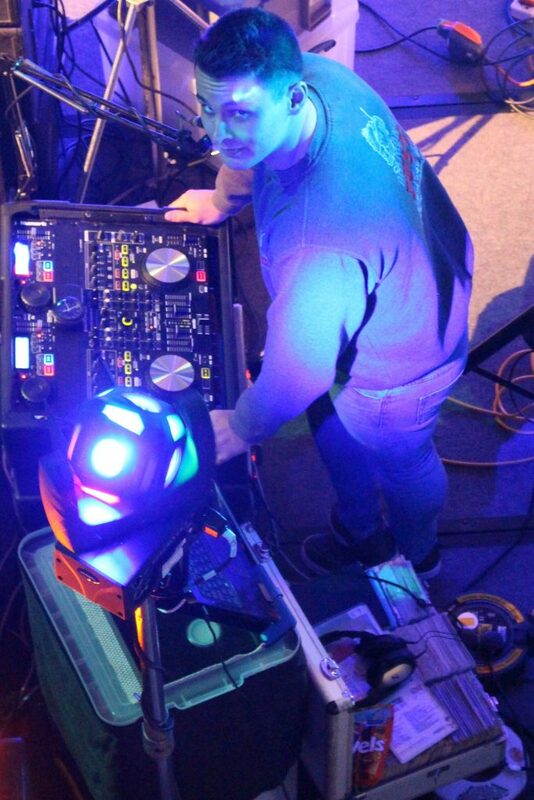 Corey and I were DJs in Llanelli at the Furnace RFC for an engagement party. 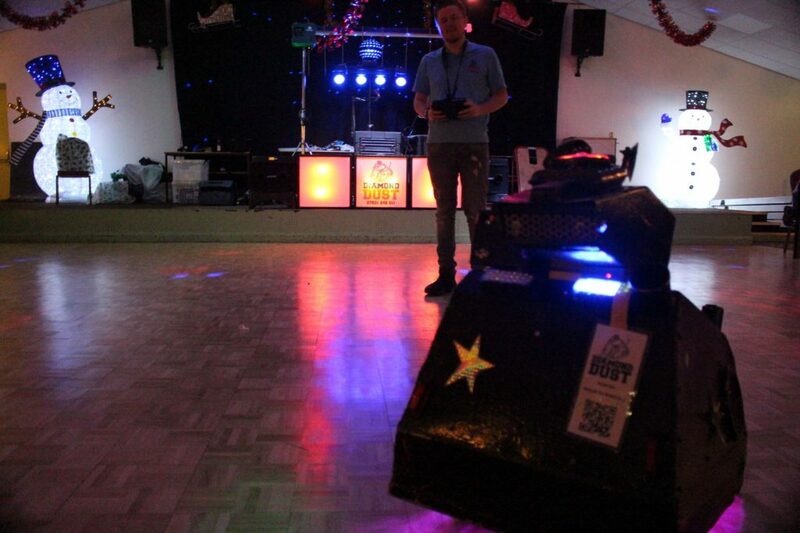 Tom was with me to do an engagement disco in Swansea Samlet Club. 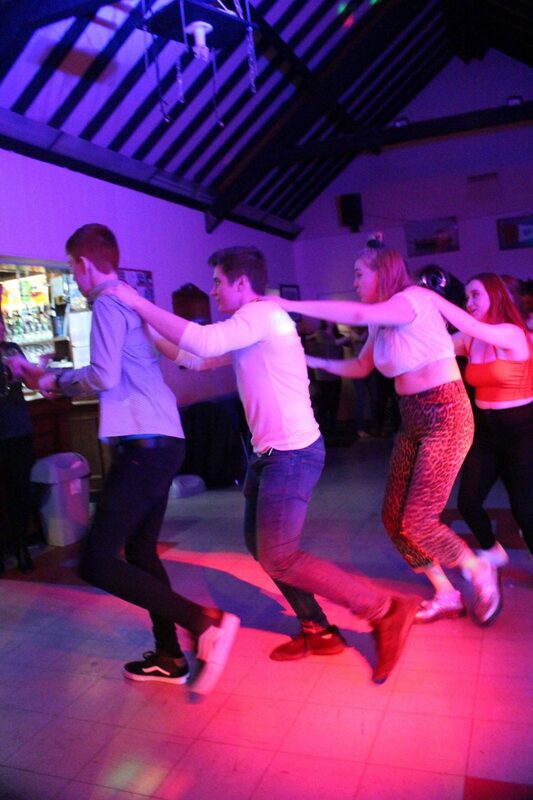 There was an 18th birthday party at Resolven RFC and one at Pontardawe Golf Club too! We had a 6-year-old birthday party at Llanelli Lawn Tennis Club. 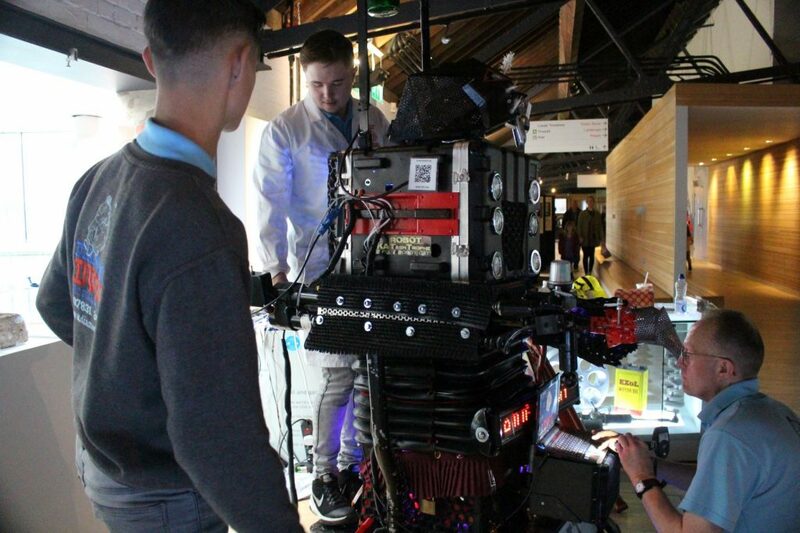 There’s more news about our 8-Foot-Robot-Cat. See our web page and our Facebook page for more information. We’re travelling a lot around Cardiff way this month. 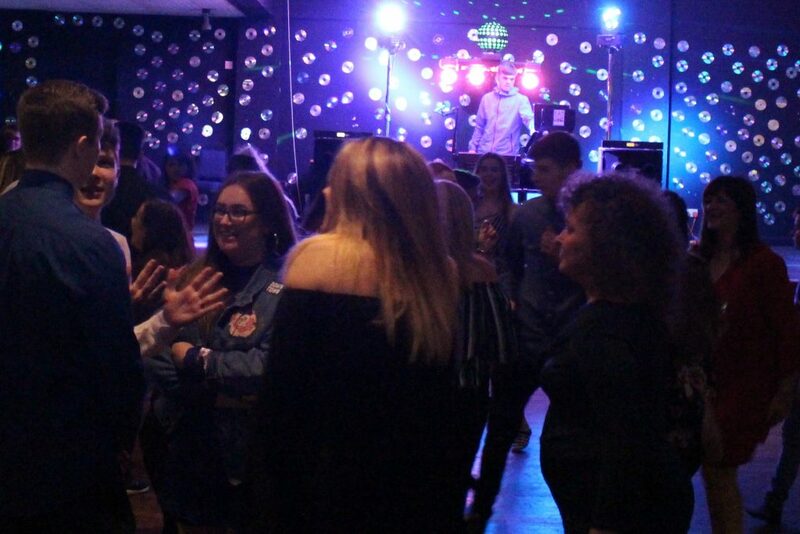 We’ve had a few Valentine discos including a teenage disco at Harlequins RFC, Cardiff, and Children’s Valentines Disco at Longford Memorial Hall, Skewen, Swansea. We have done a few Engagement parties at Aberdare Golf Club and Cross Keys RFC, Newport. There have been a few 18th birthday parties at Mumbles Yacht Club, Swansea and Bonymaen RFC. 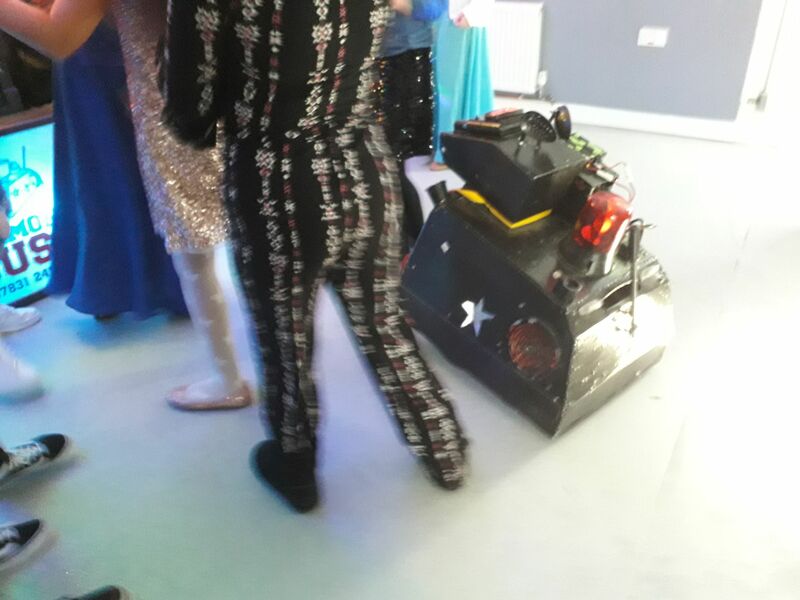 DJ Diamond Dust has appeared at Children’s birthday party at Tircoed Village Hall, Swansea at Byrd Crescent Community Centre, Cardiff, with Mascot the Robot Dog. It has been a mixed bag of gigs from Swansea. Take a look at the Blogs. Tom is still making appearances, bringing his brilliant microphone skills and unique mix of music to our audiences. 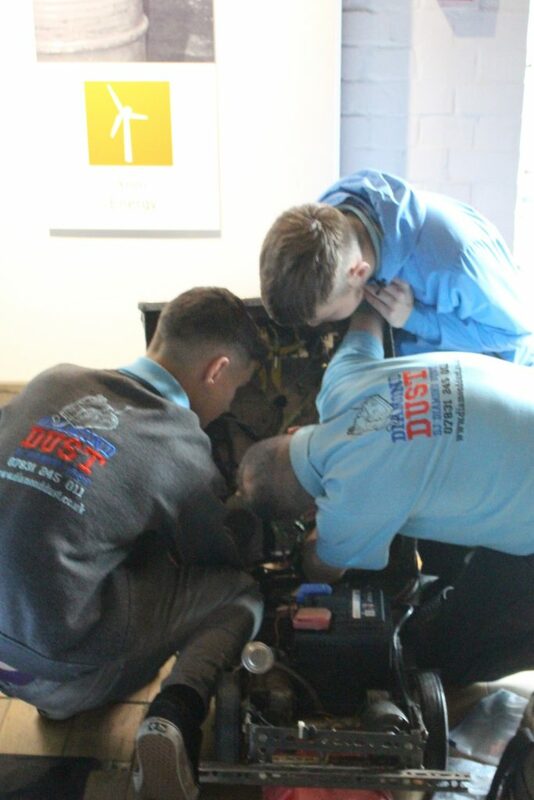 We have had new crew, who are Llian, Alex and Ollie. Tom took time off went on the Cruise liners, and Ethan has become the main DJ. 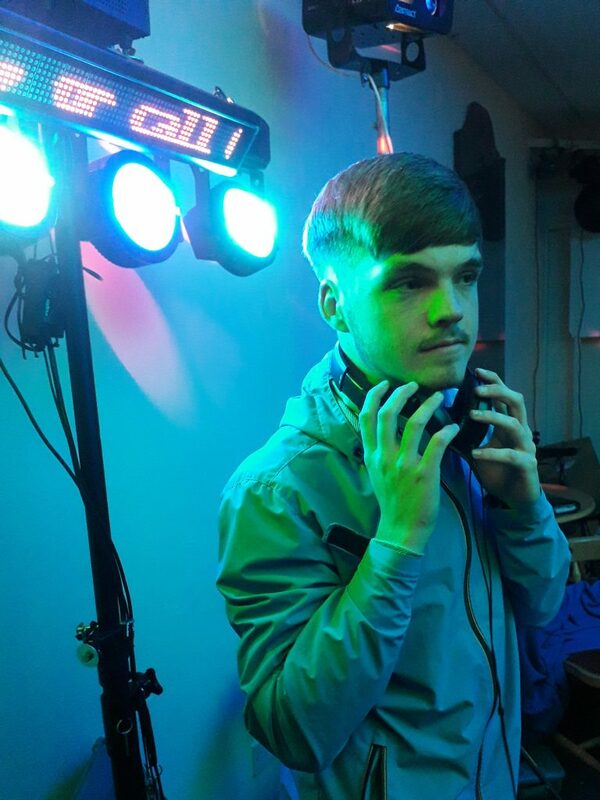 DJ Llian Davies at Cardiff Metropolitan University DJ Ollie Edwards at Birchgrove RFC, Swansea “My best gig of 2018 was in Mountain Ash Rugby Club. The atmosphere was amazing! We had great feedback from the people and everyone was having a great time. Overall, it was a very good gig!” Ollie. 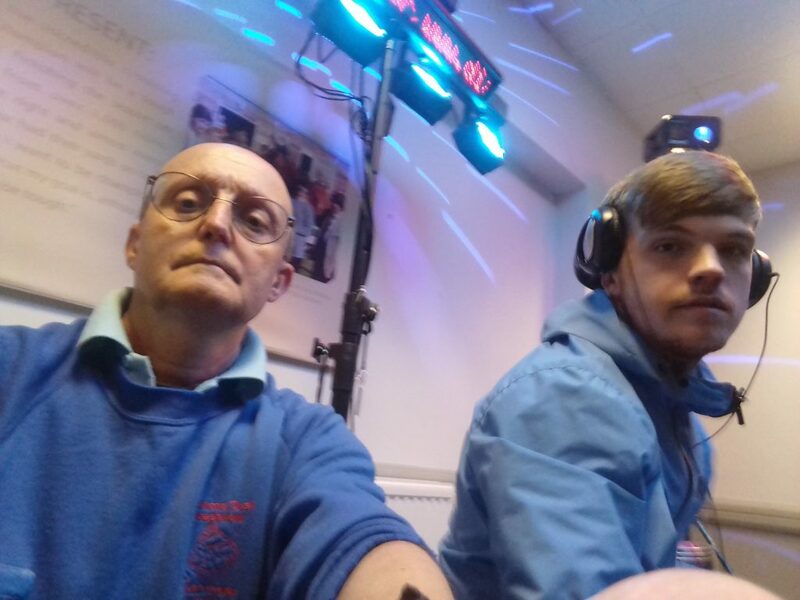 Alex Favell, one of new our crew DJ Kelly Jack Roberts running the music at Tonna RFC, Neath I would like to thank Kelly for all his hard work. Good luck for the future! 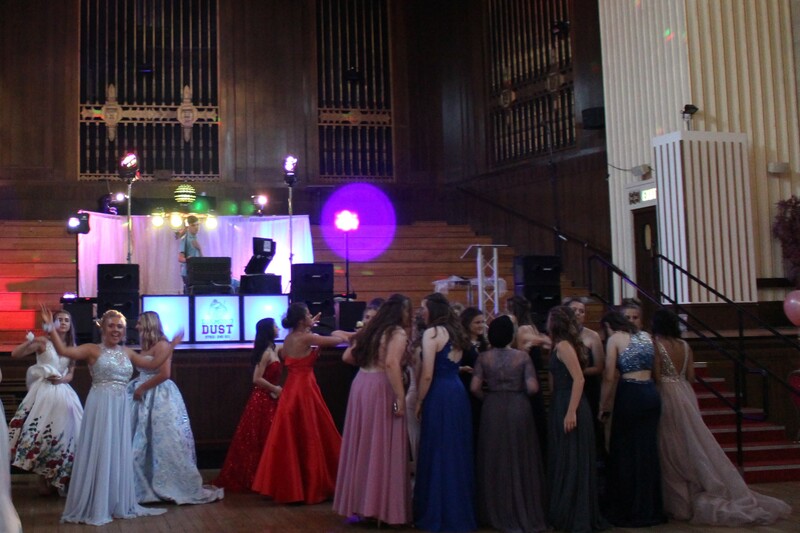 One of the biggest discos we did this year was the Brangwyn Hall, Swansea. We had to use the full PA rig to cover it, what we would normally use for an outdoor event. The most usual wedding disco, this year was by a lighthouse in Usk. The furthest out gig was Hereford racecourse Racecourse. The most memorable disco was the foreign exchange students at the Cardiff Metropolitan University. 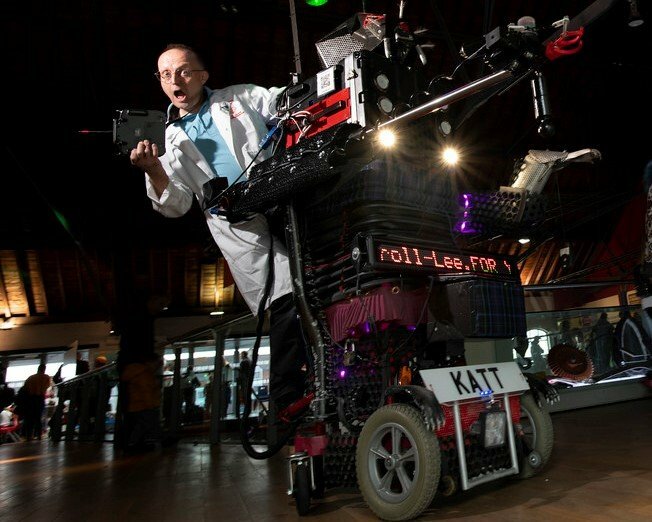 8 Foot Robot Cat and Martin Thompson at Swansea Science Festival 2018 in National Waterfront Museum The KATT has the annual appearance of the Swansea Science Festival at the National Waterfront Museum. 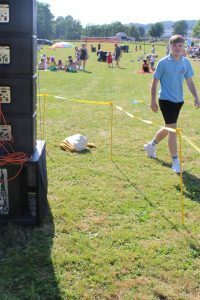 The 8-Foot-Robot-Cat worked perfectly however, Mascot the Robot was plagued with technical problems. This has been fully resolved, thank goodness. 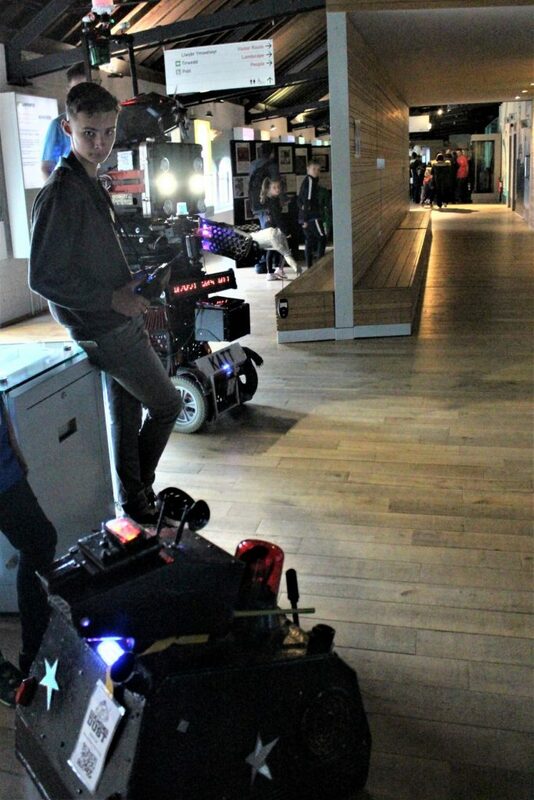 Corey is now taking a central role in our Robot Shows. Well done Corey. January 2019 It was busier this January and I am pleasantly surprised. 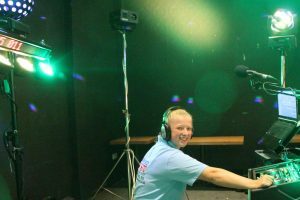 We have done a few teenage discos: including one disco in Pencoed RFC for an 18th birthday party and a 13th Birthday party with UV lighting, smoke and laser. We did a few engagements, a party at Railwaymen’s club, Swansea, and at the Lewis Jones Sports Bar, Gorseinon. 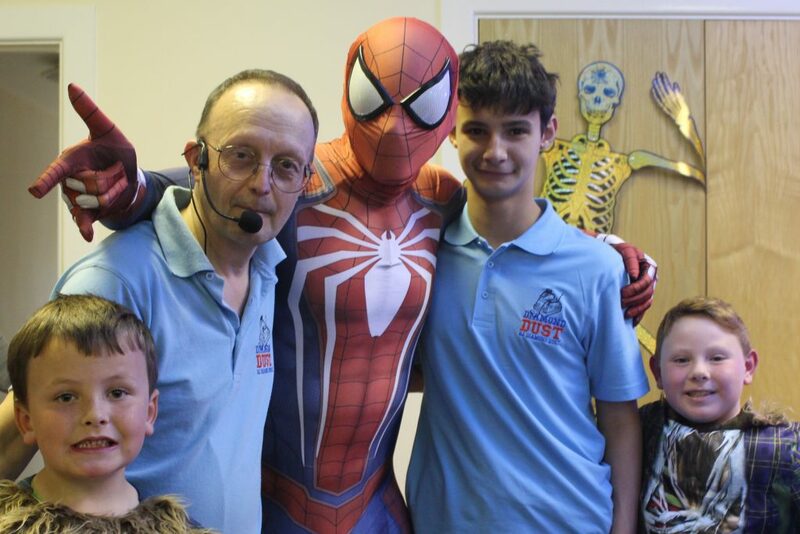 We had a few children’s parties: Children’s disco at Bonymaen RFC, Swansea and a children’s birthday party at Felindre which included Mascot the Robot Dog and a magic show. Here is our Christmas Party update. We had quite a few Children’s Christmas Parties, including one in Cardiff, Grangetown Catholic Hall, one in Skewen, Neath Longford Memorial Hall, two at Croeserw Social Club, Port Talbot, a party for children recently hospital, held in Ysgol Bae Baglan, and one in Swansea, The Rhyddings Hotel. 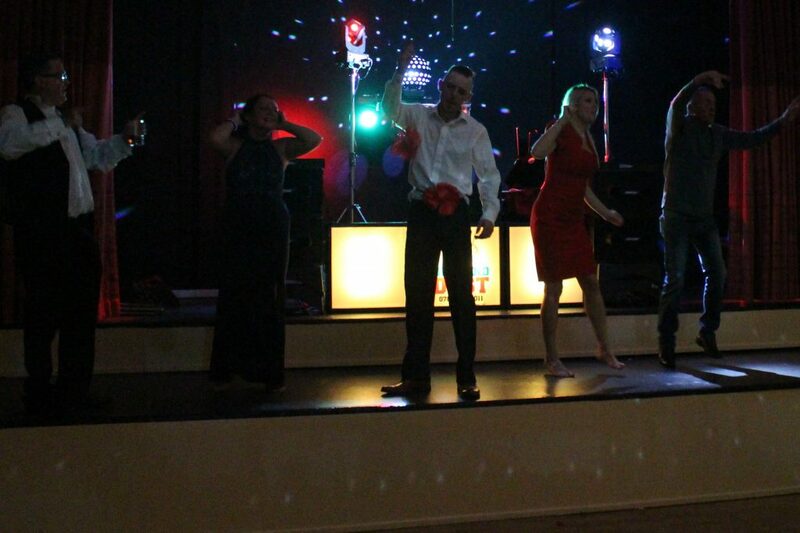 We had our New Year’s Eve disco at Aberavon Beach Hotel, Port Talbot. 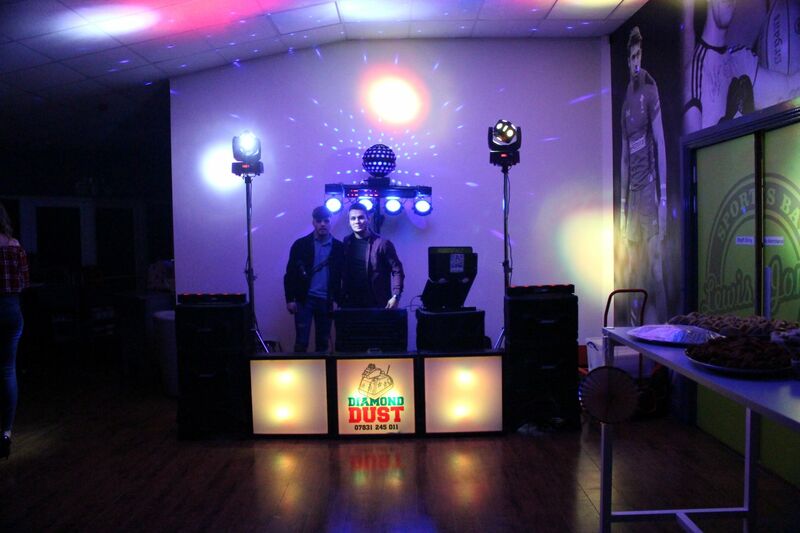 The DJ Diamond Dust crew attended a few adults Christmas Parties at Aberavon Beach Hotel, and the Dragon Hotel, Swansea. There were some birthday parties in Swansea – a 5th birthday show at Birchgrove RFC, and a 60th birthday disco at The Beach Hut Cafe, at Mumbles Pier. We did a 21st Birthday Party disco at Blue Scar in Pontrhydyfen, and a 40th birthday party at the Conservative Club, Llanelli. 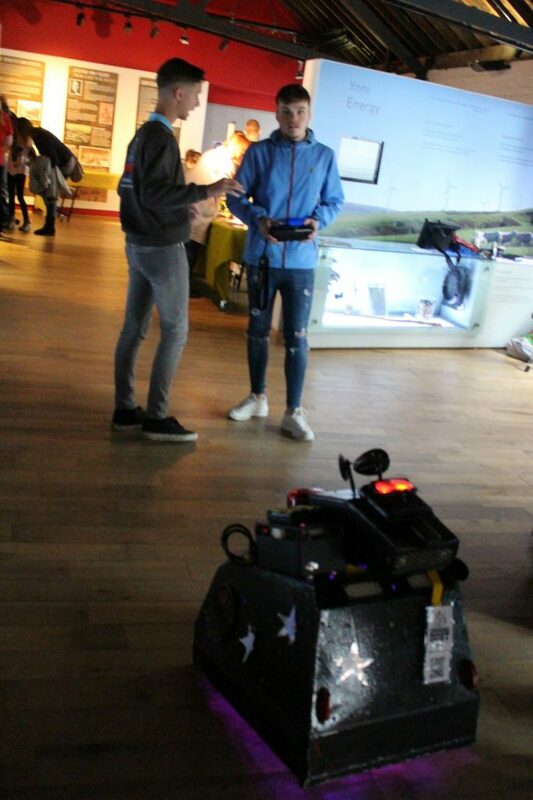 Ethan Gray with Mascot the Robot Dog at the National Waterfront Museum with the Swansea Science Festival 2018 It has been described as Wales’ largest science festival, with a series of themed zones to delight and educate. 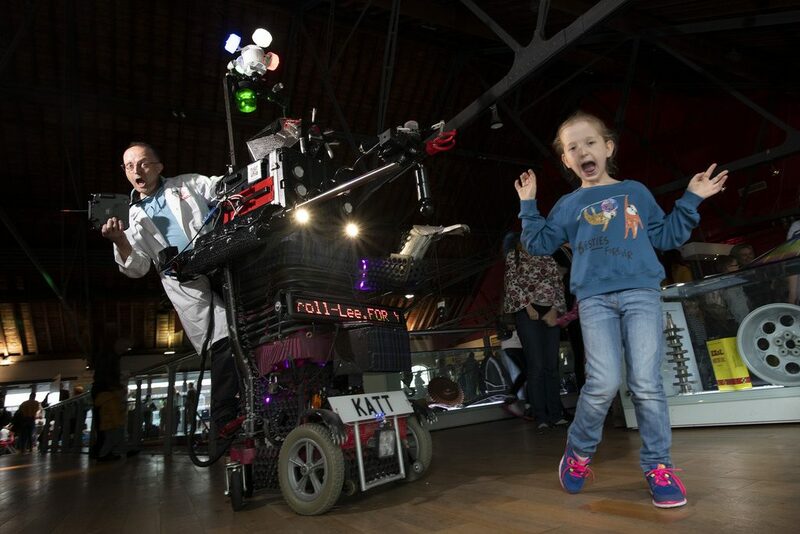 Our 8-Foot-Robot-Cat has been described as unforgettable! 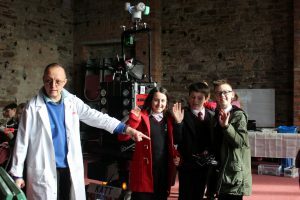 We made our annual return to The Swansea Science Festival on Sunday 4th November at the National Waterfront Museum with Mascot the Robot Dog and our 8 Foot Robot Cat. 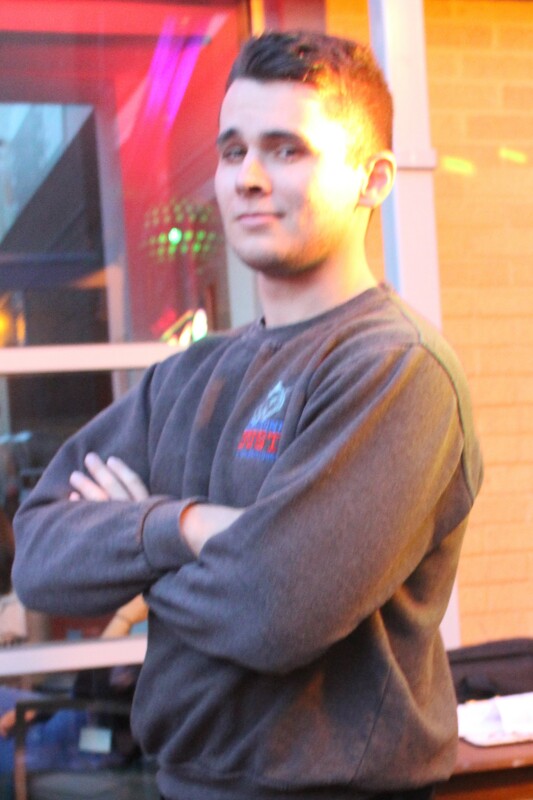 Ethan Gray provided an important role in the set up and transportation of the robots. Our stand, as last year, was in the Upper Foyer (Upstairs) area of the National Waterfront Museum. You could not miss us. It was amazing the number of adults and children that came over to say hello….some of the others ran away!!! It was quite something amazing to see the interest show by teachers from Primary and Secondary school. Perhaps we might see you at a school near to you soon. Visit our KATT Page for more information. This has been our third year and we are looking forward to next years’ event. We would like to give a special thanks to Sian Jones, Events and Engagement Officer and all the staff of the National Waterfront Museum, and Swansea University for all the support, kindness and hospitality they show to us during their event. It was a privilege to work alongside other scientists and educators. 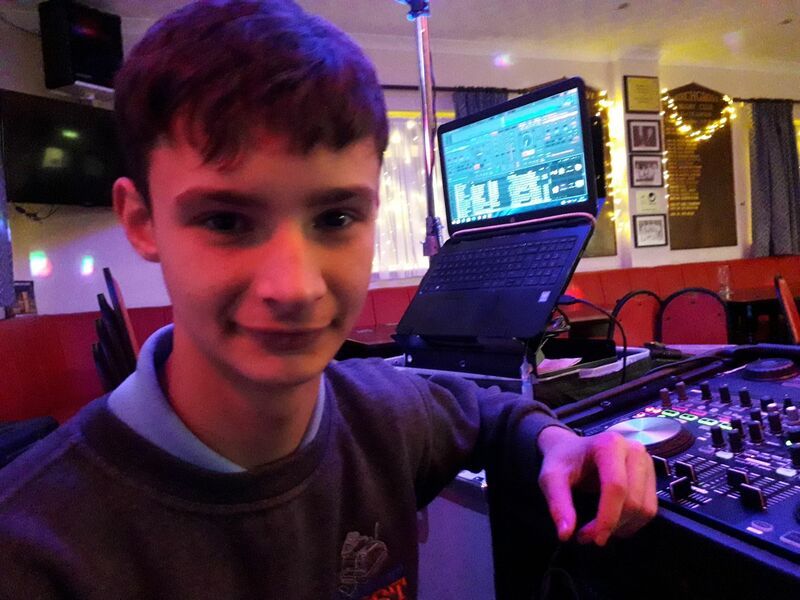 We recently did a 16th Birthday party in Ystalfera RFC with Party DJ in Swansea, DJ Ethan Gray. 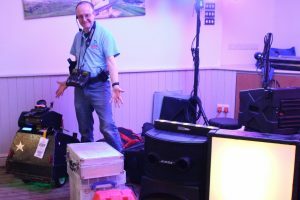 It was rather unusual, but DJ Diamond Dust did a Monday Wedding Disco at Selwyn Samuel Centre, with Llanelli Wedding DJ Martin Thompson. We had a great night at an Engagement Party at Swansea Dockers Club with Swansea Party DJ Ethan Gray and Martin Thompson. 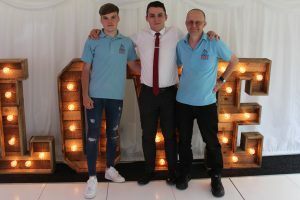 One Sunday, DJ Diamond Dust, ran a Christening party at Mountain Ash RFC Party DJ in Cardiff Ollie Edwards and Children’s Entertainer Martin Thompson who is regularly appearances as a Children’s Entertainer in Cardiff. 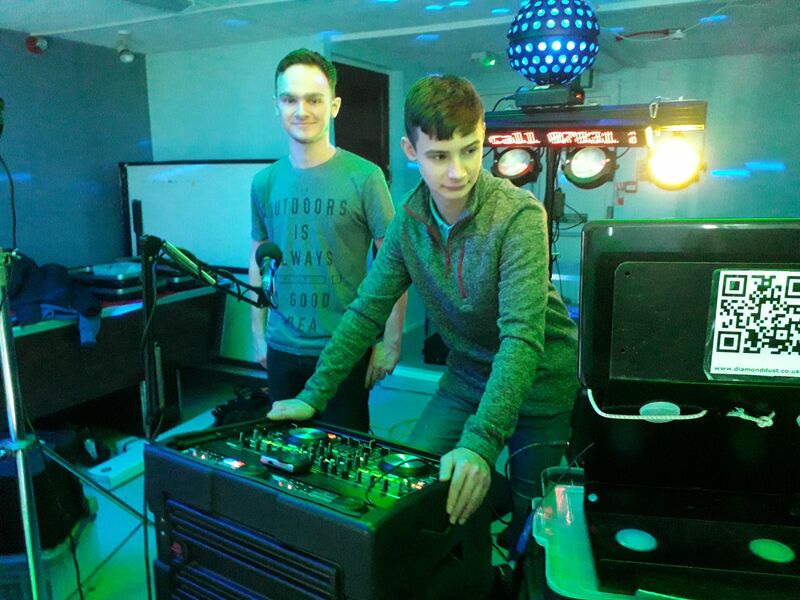 Ethan Gray and Martin Thompson were working as Party DJ’s in Bridgend for a 40th birthday party at Penybont Football Cub. 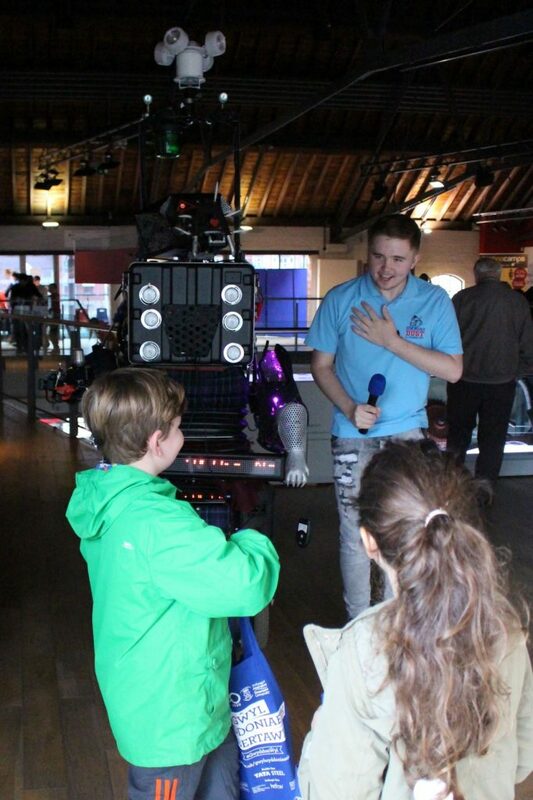 The Swansea Science Festival on Sunday 4th November at the National Waterfront Museum with Mascot the Robot Dog, our 8-Foot-Robot-Cat with Corey Perrett and Ollie Edwards. DJ Diamond Dust, Spider-man called in. We have been DJ’s at a Halloween party at Croeserw Social club, in the Afan Valley, and Longford Memorial Hall, Neath Abbey, near Neath. 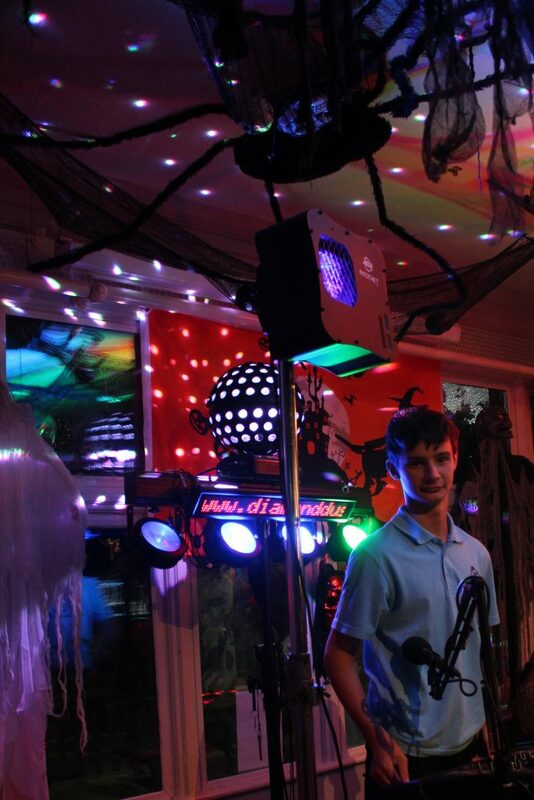 There was a Halloween Children Disco at West House Public House near Bridgend. We have had loads of birthday parties. 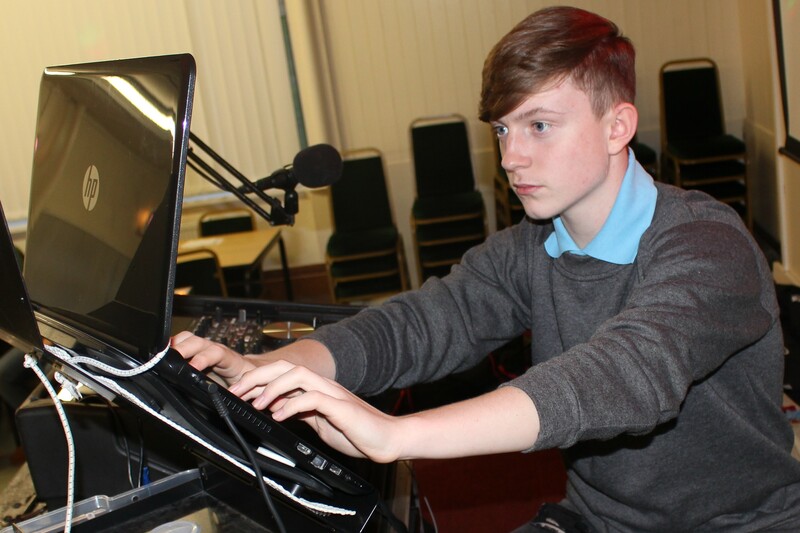 We were DJs at an 18th Birthday Party DJ at Bonymaen RFC, Swansea and Tonna RFC, Neath. 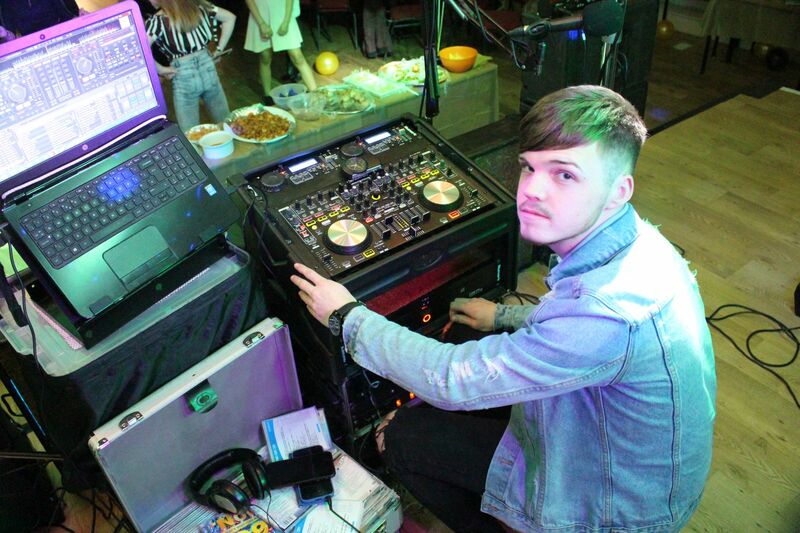 DJ Diamond Dust attended a 13-year-old disco at Skewen Memorial Hall and a 21st Birthday Party at Cefn Athletic Club, Kenfig Hill. Wedding DJs at National Waterfront Museum, Swansea and Engagement party at Skewen RFC, Neath. We are certainly having a variety of bookings throughout South Wales. We hope you enjoy seeing our Blog. We were DJ’s at Social Fund Raising evening at Aberavon Beach Hotel, Port Talbot. We would like to introduce two new members of crew, Ollie and Alex! What an amazing month for all the crew! Ethan, Corey, Llian and I been working as Wedding DJs at the Aberavon Beach Hotel, Port Talbot and at the Celtic Club, Maesteg. 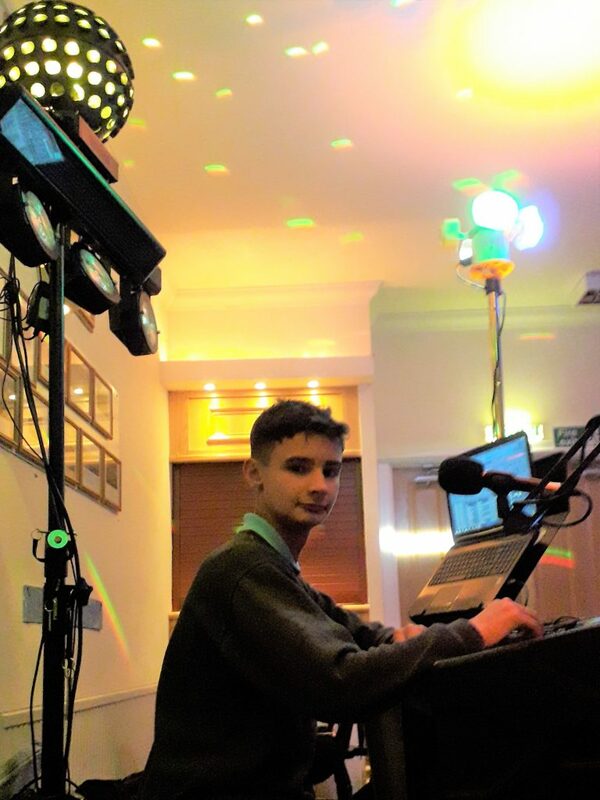 We have been Birthday Party DJs at a variety of venues, a 40th fancy dress disco at White Tips Stadium, Treforest RFC, Pontypridd, and two 18th birthdays, one at the District Club, Pontypridd, and the other at Tonna RFC, Neath. 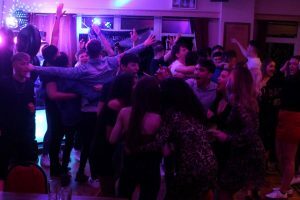 Ethan and I have been DJs in Cardiff at Harlequins RFC, Cardiff, doing return visit by request for a local Form 6 teenage disco. 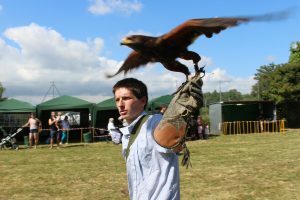 We have had a fair share of children’s birthday parties at Landore Social Club, Swansea, the Llanwrda Village Hall, Llandovery, and a birthday party at Cwmllynfell Hall, Ammanford. There was, of course, our Annual Tetrathlon Ball, a change of venue from Chepstow Racecourse to this year’s venue, at Hereford Racecourse. We are always mindful for safety and due to a drink spillage, Corey and myself had to do some maintenance in the early hours of the morning to ensure that everything was working properly and safely for the following night’s gig. We seemed to be spending quite a bit of time between Cardiff and Swansea this summer, primarily with birthday parties. 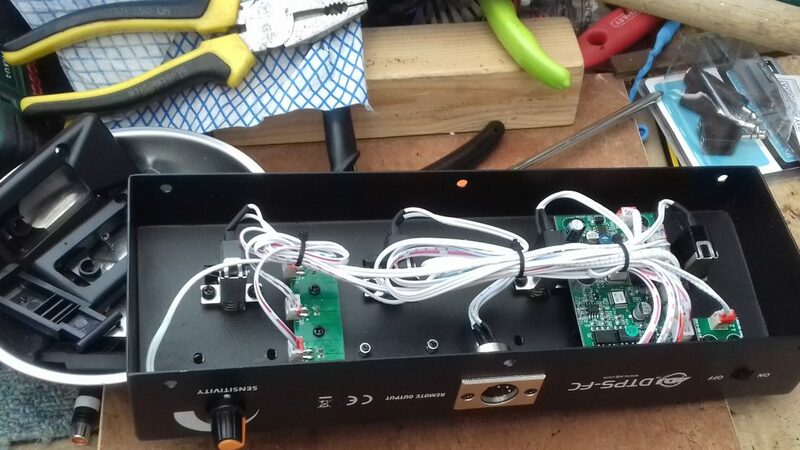 The last couple of weeks have been cooler, thankfully, so has made the moving and setting up of sound and lighting equipment much easier. There’s been a change in crew which line of some of the crew – some new guys coming in and still keeping in touch with long term friends, who will always be family. On the disco front in Cardiff, we had a Wedding Disco at Roath Sports and Social Club, Cardiff, a girl’s Birthday Party at the Powerhouse Hall, Cardiff, and Teenage Disco at the Collen Arms, Porth, near Cardiff. In the city of Swansea, we travelled to Mumbles at did a 80th Birthday Party, for a regular customer at the West Cross Inn, Mumbles, Swansea. We always have a wonderful time with them. Corey and I We did a birthday disco and the Conservative Club, in Gowerton, playing loads of requests from the 90s and quite a few Rock tracks. DJ Diamond Dust made a return visit to the Samlet Club, Swansea for a friend and former neighbour to his birthday. A return to our regular Summer venue, i.e., New Minerton Holiday Park, Tenby, where we entertained the children with magic, balloon modelling, parachute games and the ever popular Mascot the Robot Dog. We rounded up the night with disco. 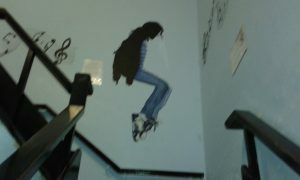 We worked in Whitland Memorial Hall for a 7th birthday Party, which is not far from our usual venue in Tenby. The usual routines with magic and the Robot Dog were a great success. We ran more lights and actually had a chance to use the smoke machine. Quite a few venues don’t allow this as more and more places have smoke detectors. It’s been a great summer with lots of people to meet and lots of places to see. The adventure continues! Introducing a new DJ to Diamond Dust is Llian Davies, continuing the family tradition of DJ’s from her brothers, Dewi and Stephan. Actually, she helped on a disco in Swansea with us a while ago. 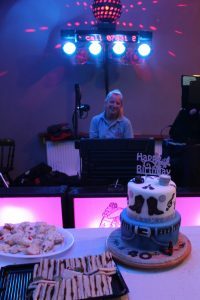 She did such a great job as a DJ, at a friend birthday party, in Swansea that we decided to ask her to join the team. 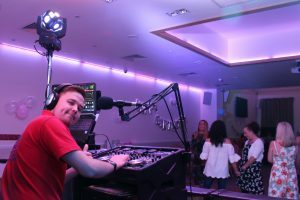 Wedding DJ We have had a few weddings this month including on at the Paul Lewis Centre, St Athan, near Cardiff, and welcomed return to Sylen Lakes, Five Roads, near Llanelli. Party DJ There has been a series of Cardiff discos at Cardiff Metropolitan University for Foreign Students, playing loads of requests of music from Italy, Palestine and China. We discovered loads of international tunes. We had a 40th birthday party Queens RFC Club, Pembroke Dock. There was quite a great deal of requests for Country Music and Line dancing and 70s & 80s rock music. This season of Year 6 Leavers Prom included parties at Glyn Clydach Coach House and Mumbles Cricket Club. 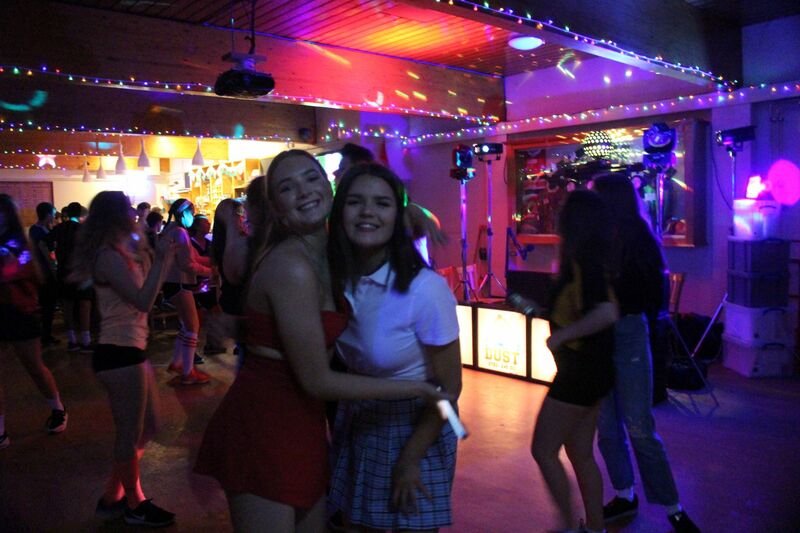 The first party was mainly new music and cheesy disco hits, while the second one was charts and rock and 60s as this was needed for the parents and grandparents. Children’s Entertainment We are continuing with our regular summer visits to New Minerton Holiday Park with Children’s Entertainment Children’s show. Our booking at Hafod community centre included Mascot the Robot Dog, the Magic Show, Balloon Modelling and our ever popular play parachute. 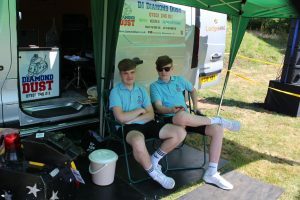 We had our annual Outdoor Road Show at Abergwili Carnival. This year we, primarily, provided public address for background music, commentary, and announcements, including judging of carnival, rose and fairy queens, lost children, raffles, competitions, and introducing the band. 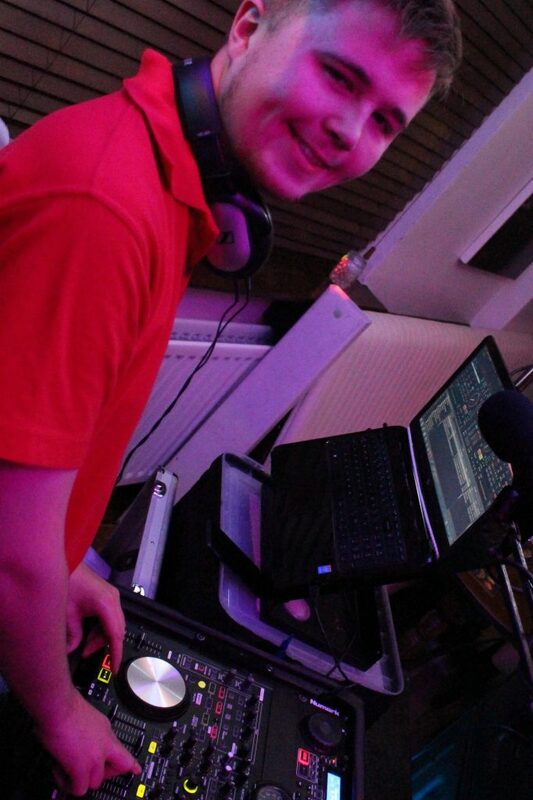 DJ in Swansea, Cardiff, Neath, Carmarthen, and South Wales. 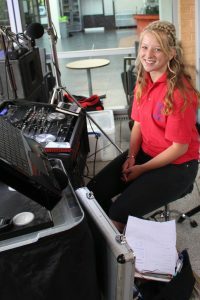 We are probably one of the longest running DJ services in the area for weddings, parties, events and children’s entertainment.